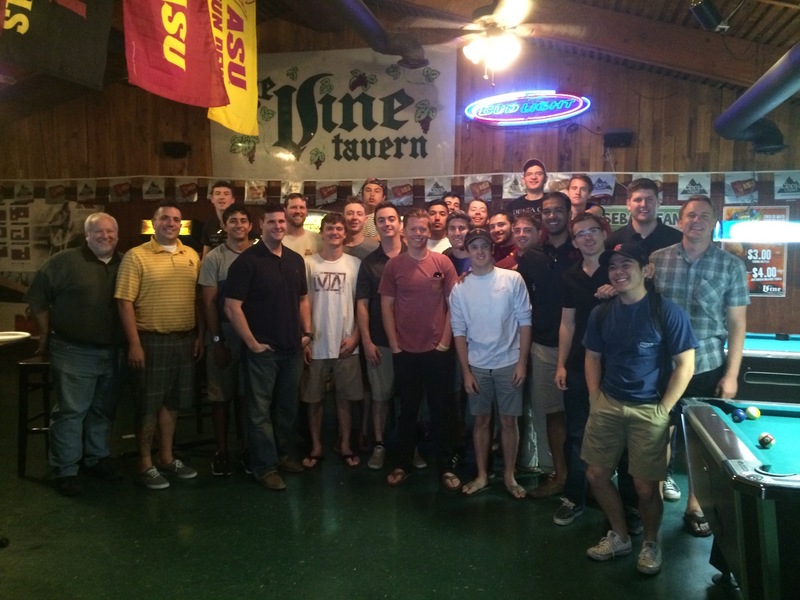 The Arizona Valley Alumni Chapter celebrated the 22 graduating seniors from the Delta Chi Chapter at Arizona State University on Sunday with a happy hour at The Vine Tavern & Eatery in Tempe. Delta Chi brothers celebrating the ASU graduating seniors. Those in attendance were treated to a catered lunch and a celebratory cake, as well as a chance to meet prominent Delta Chi alumni living in the Phoenix area and network. The graduating class, comprised mostly of the Omega associate member class, is one of the largest ASU graduating classes in recent memory. The 30 Omega associate members was recently matched in October 2016 with 31 members of the Alpha Zeta class. The Arizona Valley Alumni Chapter wishes all the graduating ASU seniors luck in their future endeavors, and looks forward to seeing them at upcoming events such as Founders Day.